Your taste buds will thank you after eating this delicious dish! 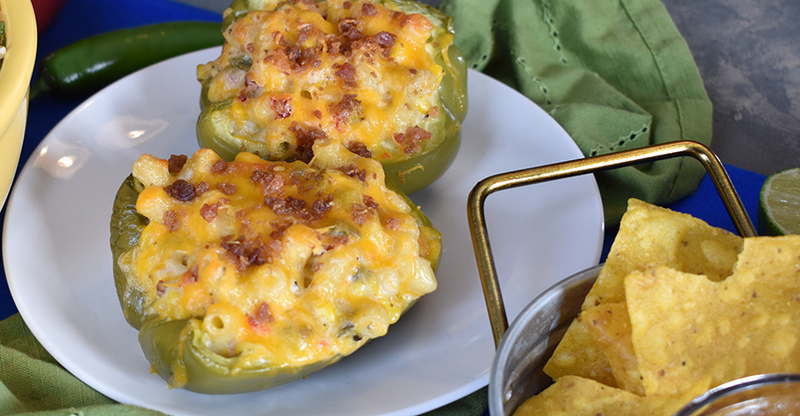 Simply stuff peppers with our Jalapeno Popper Pasta Salad, top with bacon and cheese, and bake. Add the ¼ cup chicken broth to a 9” x 13” baking pan. Wash, halve, deseed and remove stem from peppers. In a bowl, combine Jalapeno Popper Pasta Salad and 1 cup shredded Cheddar cheese. Evenly stuff the peppers with the salad mixture. Sprinkle remaining Cheddar cheese and bacon pieces on top of peppers. Bake peppers in pan for 30 minutes or until the internal temperature reaches 165°F and the peppers are well cooked. After baking, allow to cool for a couple minutes. Serve immediately or maintain at 165º to 180ºF.